WASHINGTON (CNN) -- Bored by your job? Feel like nothing ever changes? Try doing the same thing for 53 years and 2 months. Rep. John Dingell entered the House in 1955, when Dwight D. Eisenhower was president. Then give Michigan congressman John Dingell a call. On Wednesday, the 82-year-old Dearborn Democrat broke the record for the longest service in the House of Representatives in U.S. history. He'd probably be the first to tell you that a lot can change over the span of 19,420 days. When Dingell entered the "people's house" on December 13, 1955, the White House was home to a retired World War II general named Dwight D. Eisenhower. Barack Obama hadn't been born yet. The South was still in the firm grip of segregation. Less than two weeks earlier, a woman named Rosa Parks caused an uproar by refusing to move to the back of a Montgomery, Alabama, bus. The Brooklyn Dodgers had just defeated the New York Yankees to become World Series champions. Overseas, Winston Churchill had recently stepped down as Britain's prime minister. The Soviet-led Warsaw Pact had just been formed. And a gallon of gasoline cost 29 cents on average. The world, to say the least, was a very different place. 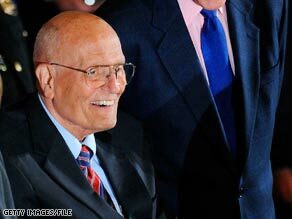 Over the long decades, however, John Dingell's core convictions have remained largely the same. The son of a prominent New Deal Democrat, Dingell has spent his more than half century inCongress fighting for labor unions, none more so than his state's United Auto Workers. He has been a consistent opponent of deals such as the North American Free Trade Agreement. His district, stretching from the industrial suburbs of Detroit to the university enclave of Ann Arbor, could arguably be considered ground zero for the troubled American auto industry. As the years have worn on, some of Dingell's positions have moved from the mainstream to the edge of the Democratic Party. A lifelong hunter, he has often opposed greater restrictions on firearms. A protector of his state's auto workers, he has often clashed with the leadership of the environmental movement. Last November, Dingell paid a price for his unwillingness to change with the times, losing his chairmanship of the influential House Committee on Energy and Commerce to California Rep. Henry Waxman, a close ally of House Speaker Nancy Pelosi. Waxman's challenge was unusual; House chairmanships are almost always awarded based on seniority. Some in Congress, however, were concerned that Dingell, a Michigan-based ally of the major auto manufacturers, would be reluctant to pursue changes in energy policy that President Obama and Democratic congressional leaders proposed during the campaign. Yet, while Dingell's power has waned somewhat, he has continued to play a leading role on the issues closest to his heart. A longtime advocate for universal health care, he was one of the last Democrats to speak out on the House floor to advocate for the recent $35 billion expansion of the State Children's Health Insurance Program (SCHIP). He was by Obama's side when the long-sought expansion was signed into law last week. Looking ahead, Dingell shows no signs of slowing down. "I creak a little more each year," he told National Journal magazine recently, "but I keep going." That's probably a good thing, because although he's the longest-serving House member in history, he will have to go a lot longer before he can claim the title of longest-serving member of Congress. That honor is held by West Virginia Sen. Robert Byrd, who has a combined 20,493 days of service in the House and Senate. And the 91-year-old Byrd, who entered the House in 1953 before moving to the Senate in 1959, has not expressed desire to retire anytime soon.